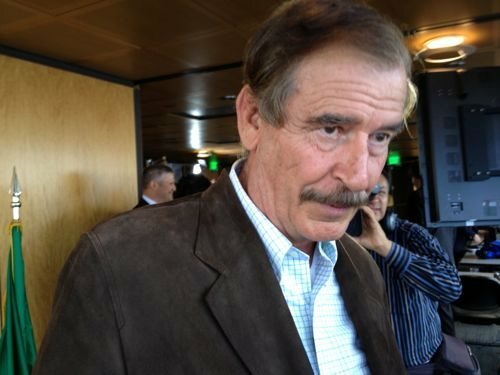 VICENTE FOX The former Mexican president was on hand to say the company's legitimate "business investment" in the US pot industry "will bring a solution to Mexico's huge crime problem." Jamen Shively, CEO of Seattle-based Diego Pellicer, announced plans this afternoon to invest $100 million over the next three years in the burgeoning "social marijuana" market with a national chain of marijuana stores. In doing so, the former Microsoft manager is not only taking a page from the Howard Shultz playbook for building Starbucks, he's also testing the Obama administration's tolerance for flouting federal drug prohibition. "Yes, we are Big Marijuana," Shively, 45, said unabashedly about ambitions to "be the most recognized brand in an industry that does not exist yet." And in doing so, politically, Shively would also create the first consolidated economic engine that advocates for legalization. At a press conference in downtown's tallest skyscraper, Shively said he and business partners will begin in Washington State and Colorado, where rules for legal pot come online this year, and wait as voters pick off prohibition across the country. Flanked by lawyers, a state lawmaker, and former Mexico president Vicente Fox, Shively said he is a "couple weeks" from an initial $10 million milestone, and within three years, he fully expects to open—some medical marijuana and some recreational marijuana—a dozen branded stores in Washington State, another dozen stores in Colorado, and as many as hundreds in California (a state where only medical marijuana is currently legal but where voters are widely expected to legalize recreational pot in 2016). A glimpse into the the commercialized pot market was evident in a menu of marijuana strains that hung in the back of the room, designed to capture the classic Latin American esthetic of tequila or cigar marketing, promoting future products with the gusto of a fast-food signboard: The "exclusive hand-selected variants" featured familial homages like "Diego Reserva" (the firm, Diego Pellicer, is named after Shively's great grandfather) to local nods like "Juan de Fuca," also the name of a waterway northwest of Seattle. Despite connotations to Big Tobbacco, he says the reputation of Big Marijuana "is not a problem for us. We are honored to have this place in history. We intend to be the number one brand in both markets"—both medical and recreational marijuana—"on a worldwide basis." The project will begin by re-branding the Northwest Patient Resource Center and other local medical cannabis outlets, and soon stores will open under recognizable franchises across several states. Keeping his headquarters in Seattle, near Green Lake, Shively says that means employing about 1,000 people locally and 10,000 people nationwide. And sounding like Big Hamburger, Shively says he predicted "tens of millions" of customers will be served. Former Mexican president Fox star-studded the presser to argue Shively's investment in the United States' pot market, an estimated $100 billion industry, is about more than lucrative returns. Fox said the business was "making history" by transferring the cannabis revenues from murderous drug cartels to licensed corporations A legitimate "business investment... will bring a solution to Mexico's huge crime problem," Fox told me. "Criminals won't be able to get the money because the money will be in the hands of people like Jamen." State representative Roger Goodman (D-45) described the infusion of cash as a "win-win for everyone, including the courageous entrepreneurs. America is watching... and the federal government better back off." But federal law enforcement is particularly punitive when multiple people collaborate to manufacture or distribute drugs, and the Controlled Substances Act prohibits interstate investments in the drug trade. So will the federal government look at this operation as anything short of a conspiracy? Shively tried to turn that question around, saying, "It is a federal conspiracy to obey the law." He insisted his plan for a nationwide chain of pot stores is a "mitigated" investment risk but was mum on details of how finances were structured (like many business, in which funding arrangements are private). That said, Shively noted, cannabis sold in Washington must be grown in Washington and all parties would adhere closely to the laws of respective states. That caution was echoed by John Davis, CEO of the Northwest Patient Resource Center, who emphasized running operations to the letter of the law. "By showing our success here, we will make people comfortable with moving into new markets," Davis said.